Mike Lysakowski’s artistic passion literally lies in the fast lane! In fact, this lifelong New Castle, Pa. resident has been involved with auto racing since a very early age. After working as a columnist, writer, reporter, and photographer for the auto racing magazine, RPM (based in Latrobe, Pa.) as a teenager, he soon started his own business at age 17—publishing a yearly pre-season publication for auto racing fans. Lysakowski’s once-a-year magazine was an instant success, and led to other printing and publishing projects that catered to the auto racing industry. “By age 20, my small business, Motorsport Aspects Limited, had three separate publications on sale at the Indianapolis Motor Speedway museum,” he adds. Lysakowski was first invited to lend special analysis to broadcasts as an expert, but soon he evolved into the play-by-play (or “anchor”) of race broadcasts on television, radio, and the internet. “I worked for organizations such as NASCAR, the United States Auto Club, the All-Star Circuit of Champions, and locally, the Unified Force Race Championship Tour (broadcast on Comcast Sports),” he notes. 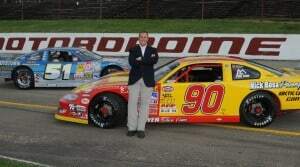 In fact, he worked full-time in auto racing until 2008 when Lysakowski began his career in health care marketing with Quality Life Services (a locally owned, family-operated business offering long-term skilled nursing care and personal care with seven locations in Butler, Armstrong, Westmoreland, Mercer, and Fayette Counties). After working in advertising and public relations for over three years with Quality Life Services, Lysakowski now specializes in outside sales and marketing. As a broadcaster, he still works over 80 races per year (down from the 140-160 he use to broadcast), and co-hosts a radio show on Monday nights via the Speedway Productions Network (SPN). Lysakowski’s intense interest in announcing and broadcasting has been fueled by his longtime passion for auto racing. “The best part about getting involved in the sport as a teenager was that I got to meet, know, and work with all my childhood heroes whose posters covered my bedroom walls when I was a pre-teen,” he explains. Lysakowski admits that if not for his current health care profession, he would probably still be working over 150 races per year. “But thanks to health care marketing and the wonderful people at Quality Life Services, I am able to sleep in my own bed and spend time with my dog more than at any other time in my life—I’m grateful that my entire life is not ‘on the road’ these days,” he concludes.